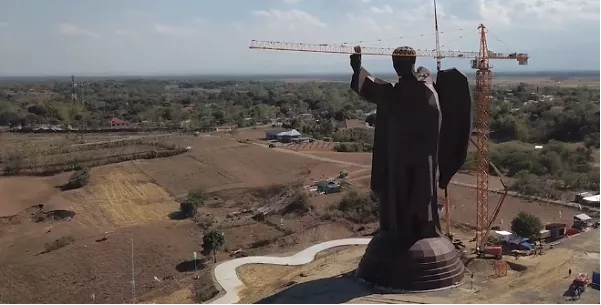 The 50.23-meter statue of St Vincent Ferrer at the Saint Vincent Ferrer Prayer Park in Barangay Bani, Bayambang, Pangasinan holds title of tallest bamboo sculpture. St. Vincent Ferrer giant statue is situated at the center of the prayer park, it is made of tons of steel and carefully engineered with bamboo, said to be taller than the Statue of Liberty in New York. The project cost around P250 million in a 67-hectare land which measures 21,000 square meters (2.1 hectares). It has a five meters wide pathways for persons with disability (PWDs) that will pass through the 15 stations of the cross with three events places and a parking space that can accommodate 120 cars. The Guinness World Records ajudicators officially recognized the town's patron Saint Vincent Ferrer statue which marks the 400th founding anniversary. This is said to be the second Guinness record of the town. The first is for the longest barbecue with (8kms) long in 2014.